DO YOU HAVE A QUESTION ABOUT INSOLVENCY? IF SO, SEND US AN EMAIL. The material published on this web site is general in nature. It is made available on the understanding that the Author is not thereby engaged in rendering professional advice. Before relying on the material in any important matter, users should carefully evaluate its accuracy, currency, completeness and relevance for their purposes, and should obtain any appropriate professional advice relevant to their particular circumstances. In some cases the material may incorporate or summarise views, guidelines or recommendations of third parties. Such material is assembled in good faith, but does not necessarily reflect the considered views of the Author, or indicate a commitment to a particular course of action. Links to other web sites and blogs are inserted for convenience and do not constitute endorsement of material at those sites, or any associated organisation, product or service. For a list of names (in alphabetical order), addresses and licence numbers: Download from ASIC as a searchable PDF file - updated to 31 August 2017. But NOTE: The address given for a number of liquidators is incorrect (old?). Therefore the best way to find a particular liquidator is to use the free search of the ASIC Professional Registers of liquidators, on the ASIC Connect webpage. (See image for HELP.) 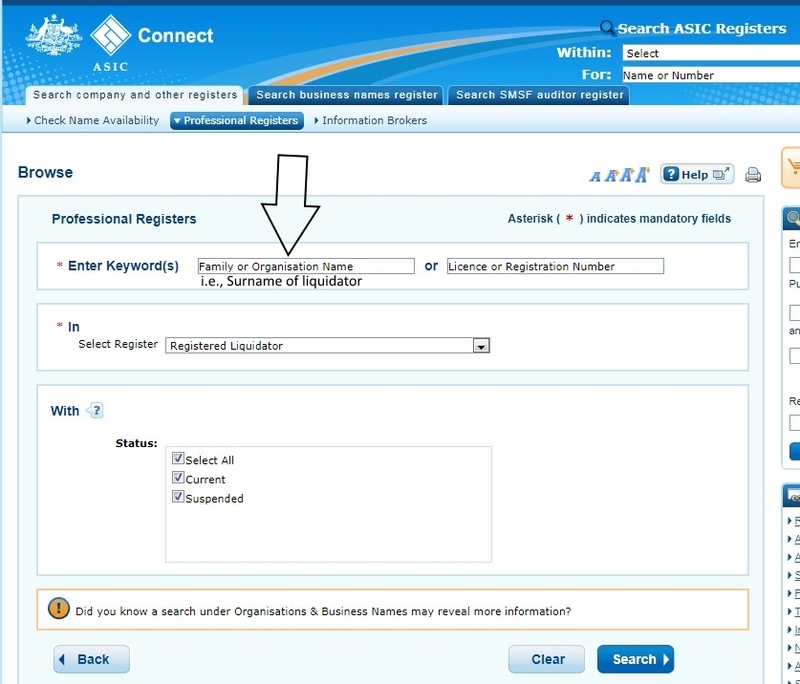 To go to the ASIC Connect Professional Register search area CLICK HERE. Topics: "Safe Harbour" for directors and restriction of "ipso facto" clauses in contracts. "Treasury Laws Amendment (2017 Enterprise Incentives No. 2) Bill 2017 - Bills Digest No. 33, 2017-18, Parliamentary Library (Australia), 11 September 2017, by Jaan Murphy. Includes background, committee considerations, position of major interest groups, key issues, examples,and alternative proposals from interest groups. 35 pages.
" Three recent developments in insolvency law." 15 page pdf. Paper by Justice Ashley Black, Supreme Court, NSW, on liquidator's remuneration, voidable transactions, and the Insolvency Law Reform Act 2016. Presented at Corporations Law Conference in August 2016. This is an ASIC hosted website for the publication of notices, including insolvency and external administration-related notices, required to be published under the Corporations Act 2001 and Corporations Regulations. this site provides an easy to search central location for the following two categories of notices: * notices arising out of a company's external administration (eg court liquidation, voluntary administration etc); * notices of winding up applications filed with an australian court; * notices required to be published in a members voluntary winding up (winding up of a solvent company); * some notices relating to schemes of arrangements under part 5.1 of the corporations act (insolvency related); * notices relating to voluntary or asic-initiated proposals to deregister a company; * some notices relating to schemes of arrangements under part 5.1 of the Corporations Act (non-insolvency related); * notices of asic's intention to wind up a company under section 489ea of the Corporations Act. If you want to search the publication website, you don't need to register; just click on the browse/search tab and start searching. Note that the publication website only contains notices published from 1 July 2012 (when the website commenced operation). Freely available datasets from ASIC and AFSA (Australian Financial Security Authority) and many other authorities are accessible from the data.gov.au website. ASIC datasets include Company Dataset, Liquidator Dataset and Business Names Dataset. AFSA datasets include Personal Insolvency Statistics. "Creditors' Rights in Insolvency in Australia: A Practical Guide". 1994 book by Peter J Keenan. ATO Director Penalty Regime. Personal Liability of Directors. Debtor Profiles - collections of statistical data on persons taking advantage of solutions contained in the Bankruptcy Act 1966. GEERS - General Employee Entitlements and Redundancy Scheme. Personal Insolvency Regulator Newsletter - newsletter of the Personal Insolvency Regulator in Australia. Find an auctioneer or valuer in Victoria. The resources on this site are provided free-of-charge. If you would like to make a donation towards the cost of hosting this website, please send an email to - insolvencypractitioner@gmail.com - and I will forward payment details.